It is always a very exciting day when my tomato plants can finally go into the ground! I start all the seeds indoors. 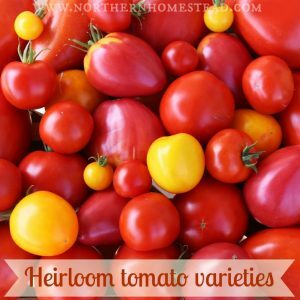 We grow mainly heirloom tomato varieties. Tomatoes are a warm weather crop. They do not tolerate frost and do not like cold, wet weather either. 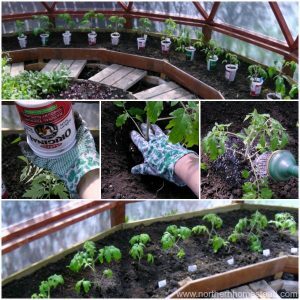 To plant tomatoes into the garden it is best to wait till the last frost day or, if the weather is still cold and windy, wait a week longer. If you want to be early, give them some frost protection. 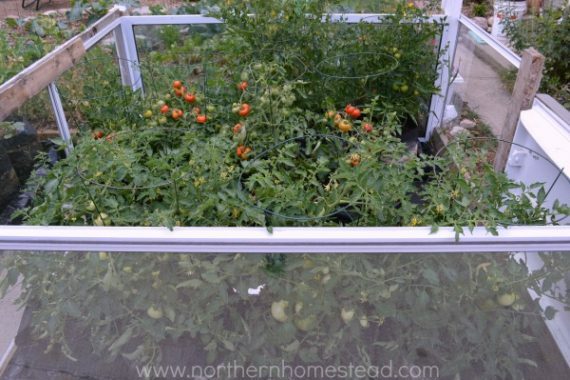 The best place to grow tomatoes in a northern garden is a greenhouse. Here they can be planted about two weeks earlier, but still might need frost protection. 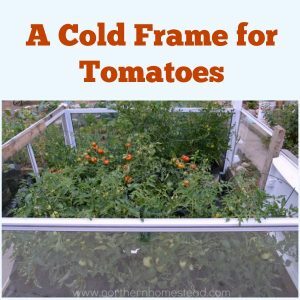 If you do not have a greenhouse then a cold frame for tomatoes works great too. Location is everything when it comes to growing tomatoes. 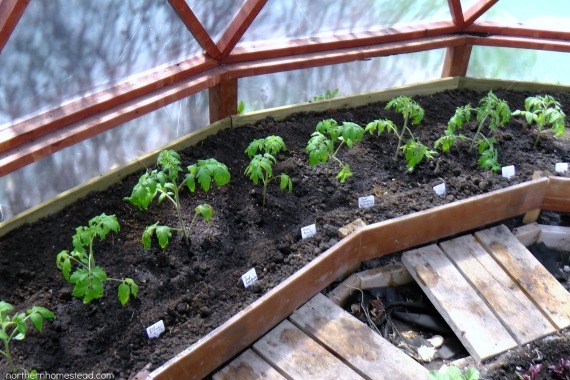 A greenhouse or cold frame are the optimal growing spaces for tomatoes in cold climate. 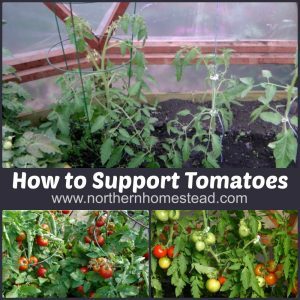 If you do not have a greenhouse, find the spot in your garden that is too hot for most crops – it might be just right for tomatoes. 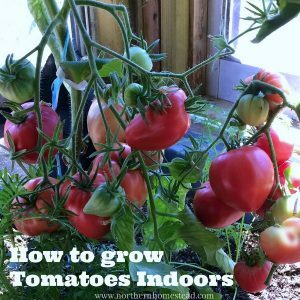 If you have a warm spot on your patio or deck instead of in the garden, tomatoes can be grown in pots or grow bags as well. We grow lots of tomatoes in grow bags on our driveway. The heat from the concrete and the black bags will help to keep the heat loving plants warm. See how to grow in grow bags. 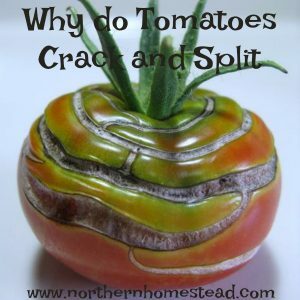 Note, if you are in a warm climate, tomatoes might be too hot in containers on your driveway. We are speaking about a cool climate here. Plants can’t go from indoors right into the ground, it will put way too much stress on them. First get them used to the outdoor or greenhouse environment while still in the pot. Starting with a few hours in the shade and then leaving them for longer. This way they will get used to their new location. 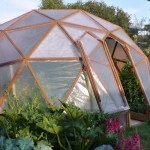 If you like it more convenient, you can harden the plants off in a temporary greenhouse frame. Read more about that here. After the plants are used to their new environment they can be transplanted without being killed in the process. Indeterminate varieties can be grown vertically and need about a foot to a foot and a half of space if pruned to a single stem. Determinate varieties will grow to a bush and need 2-3 feet in diameter. 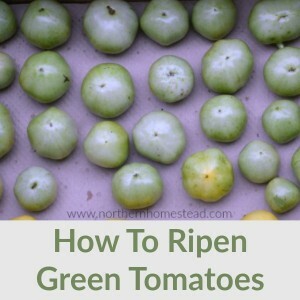 Tomatoes like airflow, do not plant them too closely together. Read also about determinate or indeterminate tomato plants. 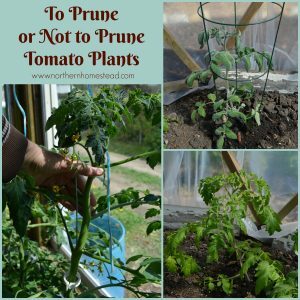 Be sure not to water the plant too much before transplanting so the soil holds together better. 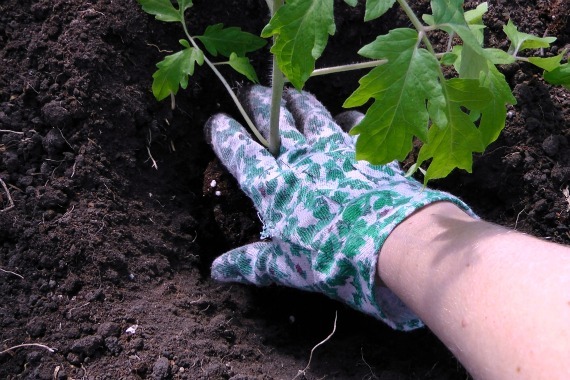 Dig a bigger hole than the plant is – it helps to loosen the soil all around the plant and encourages root growth. 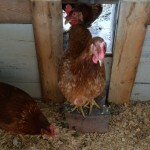 Add 1-2 cups manure to the hole before planting (I usually use sheep manure). The manure will give the plants a boost. The opinions about using manure in the garden are divided. Some claim that manure only makes the plant greener, I can’t attest to that. Water the hole generously. You want the plant to reach down for moisture and nutrients. 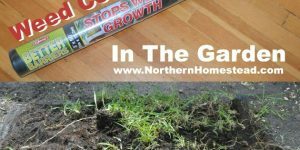 This way you will not have to water as often during the growing season. 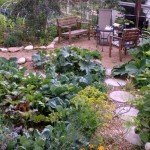 Read also how to water your vegetable garden. 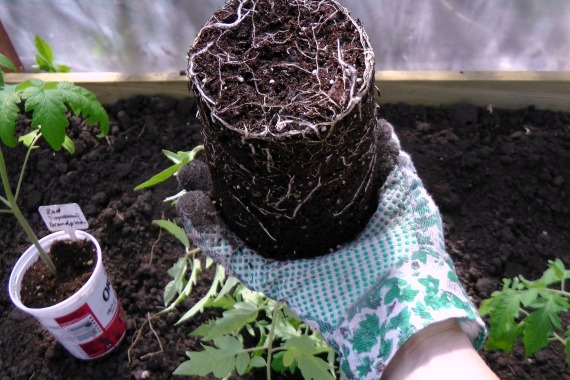 If the tomato plant is a bit leggy it can be buried deeper, just like you do when transplanting the seedlings. Some growers like to grow tall leggy seedlings in order to be able to lay down the plant instead of planting it vertically. 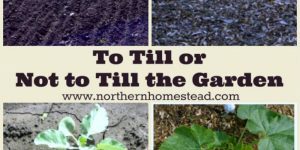 It might be worth it if you have a long growing season and lots of space. By turning the pot upside down and tapping on the pot, the plant will come right out. Now place it gently into the hole and fill the hole with loose soil. 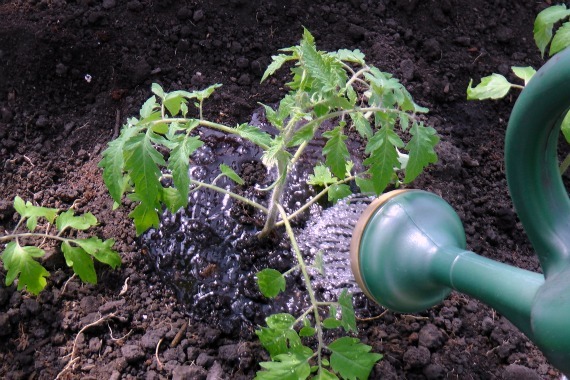 Do not press it down too hard but water the plant right away; the water will push the soil down as much as needed. It is good to make a mold around the plant for watering, so that the water can go directly to the plant and not flow away to lower ground. 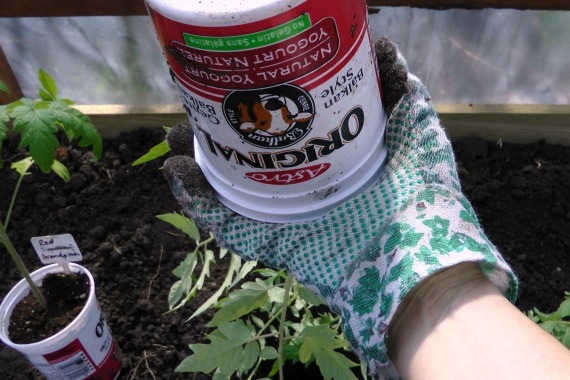 Cover the soil around the plant with mulch (straw, wood chips, grass clipping), or simply a newspaper. 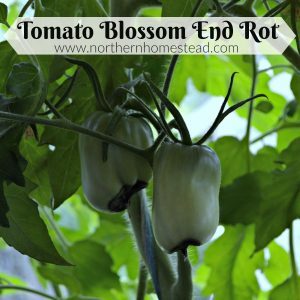 You will need less watering and the tomatoes will be tastier. Give the plants some protection from the sun during the first days. A Frost Blanket works very well for that. It also gives some protection from wind and cold during the night. I leave the blanket on for a few days even in a greenhouse. Now I like to say a prayer for my plants. I am very aware that I can do only as much as I can. The Creator God is the one who gives growth and provides fruit, why not ask him?! Then sit back and watch the plants grow and produce lots of fruits! Hi Judy, thank you, I did enjoy visiting you! We arrived safely and the Bees are at there new location. Somehow I am starting to like them :). And yes, I will blog about them. Your post is getting me all excited for spring!!! I am not sure how much of a garden I will have this year, but I am excited to be digging in the dirt once it warms up! Looking forward to spring too. Growing tomatoes is one of my favorite things to do! Your greenhouse is so beautiful! 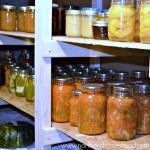 I love heirloom tomatoes – great information Anna! Thank you! 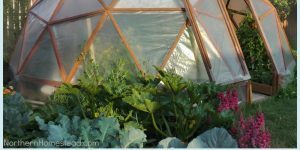 Yes a GeoDome Greenhouse is something very special. Do not be so hard on yourself. Sometimes we do everything right and plants do not grow. It is not all in our hands, just try again! Those sure are some healthy looking tomato plants! Mine are coming along quite well. I’ll be putting them into my faux peat pots soon so they can get stronger before the hardening off time. Looking forward to fresh tomato season! Thank you, appreciate it very much! You are awesome, Tessa! 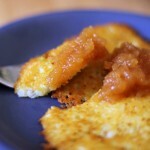 Hi Anna, just dropping a note to let you know I featured this post on the new, revamped Green Thumb Thursday Blog Hop. 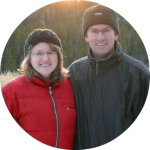 Your post is fabulous so I will also be sharing on G+. We hope to see you again tomorrow. Oh thank you, Tanya! 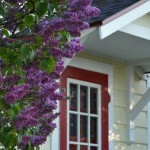 Will had over to see it and share some more on your new, revamped Green Thumb Thursday Blog Hop ;). Hi! 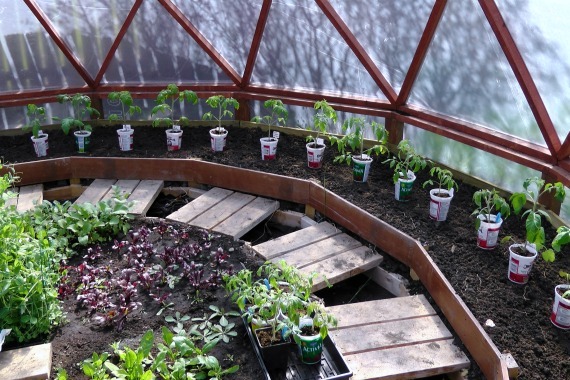 I too live in a harsh environment for vegetable gardening and have to use a greenhouse. I was wondering why you put the frost blanket over the tomatoes since they are inside? Thanks & I love your blog! Thank you, glad you like the blog ;). The frost blanket gives the just transplanted plants some shade from the direct sunlight. It helps them to have less transplanting stress. Plus early in spring we still can have some (more) frost. Tomatoes do not like it cold. I love your garden, so cute! Thank you, Heidi! At the moment we are working on our new garden. Lots of work and lots of fun. Happy gardening! 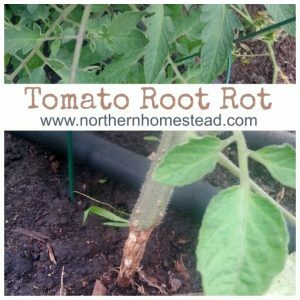 Your tomato transplants look so healthy and hearty. 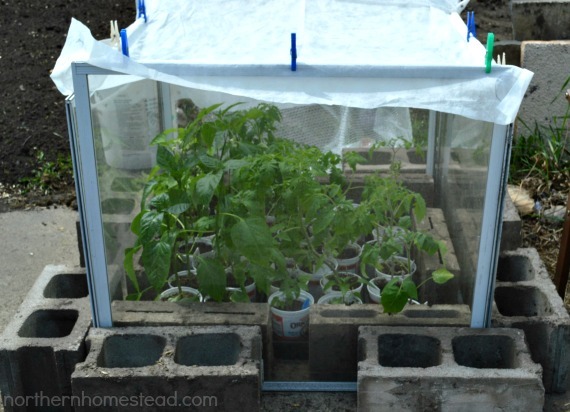 I love the idea of using a frost blanket for the first couple days to help protect the tomatoes from sun, rain, and give them a little protection overnight. Thank you Rachel! Tomatoes are easy to grow with a bit extra care. 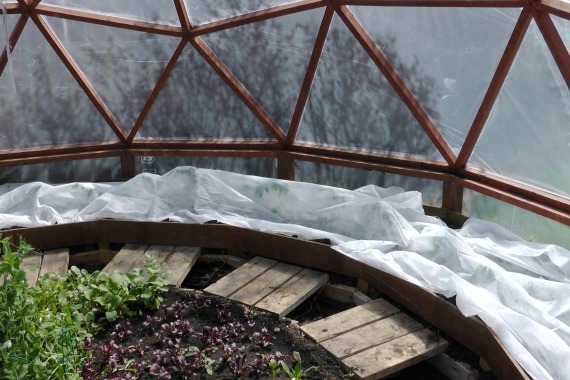 lOVE YOUR DOME GREENHOUSE, I ASSUME YOU BUILT IT YOURSELF. WISH I HAD ENOUGH CLEAR LAND TO BUILD ONE. THIS YEAR I AM GROWING EVERYTHING ON MY DECK. BROKE MY ARM IN EARLY MARCH SO NOT ABLE TO GET OUT AND PREPARE A GARDEN PLUS WE HAD SO MUCH RAIN THIS SPRING (MOST RAIN IN JUNE IN HISTORY). THEN 2 WEEKS OF SUPER HOT NEARLY BURNED EVERYTHING SO HAD TO MOVE ALL TO THE SHADY PART OF THE DECK. NOW WE ARE GETTING NORMAL EARLY SUMMER WEATHER. A GREENHOUSE WOULD REALLY HAVE HELPED THE PLANTS. Yes, we did build the greenhouse our self. Glad you ware able to keep the plants alive.